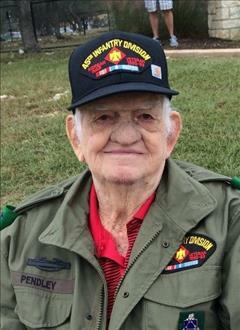 Herbert L Pendley was born November 25, 1932 in McIntosh Co. (Hanna) Oklahoma. He passed away September 2, 2018 in Round Rock, Texas at the age of 85. He is survived by his wife Lula May Pendley of Round Rock, Texas, his sister Doris Ingle of Sacramento, California and his children Kathy & Larry Lesley of Wildomar, California, Herbert Jr. “Rusty” & Susan Pendley of Cedar Park, Texas and Chad and Cathye Pendley of Choctaw, Oklahoma. Grandchildren: Layla Lesley-Phillips of Alaska, Reagan and Larry Davis of Cedar Park, Texas, Katie Pendley of Edmond, Oklahoma, Zachary Pendley of Antlers, Oklahoma, Jessica Lesley of Wildomar, California, Chayne Lesley of Wildomar, California, Charlotte and Micah Single of Norman, Oklahoma, Andrew Shinn of Frisco, Texas and Mark Shinn of Dallas, Texas, Chris and Meg Jordan of, Spring, Texas and Jason and Kerri Jordan of Cedar Park, Texas. Herbert has 17 great grandchildren and 2 great -great grandchildren. Herbert was preceded in death by his parents Martin and Mary Pendley, and siblings: Laura Pendley, Martin Pendley, Treola Taylor, Lorene Burleson, Glen Pendley, Jacob Pendley, Virginia Smith, Merle Pendley, Harvey Pendley, Pearly Woods, Sam Pendley, Gertrude Martin, Effie Kidwell, Roy Richison, Agnes Richison, Ray Richison, Opal Richison, twin siblings and an infant sibling. Herbert was the youngest of his 21 siblings. Herbert grew up in Hanna Oklahoma working on his father’s farm. He married his hometown sweetheart Lula May Williams in August, 1950, just before he left to serve in the Korean war. They recently celebrated their 68th wedding anniversary August 19th. From Hanna, Herbert joined the Oklahoma National Guard and was deployed to the Korean conflict with the US Army Co M 180th/45th Infantry Division. After returning from the military, he set off to work in the oil fields of West Texas. He later worked for the Garden City, Texas School system for many years, before returning to the oil fields briefly. He then worked, and retired from, many years with the Texas Department of Transportation San Angelo/Sterling City District. Herbert was man of service to his nation and his community. He loved his work with the Sterling City Texas Volunteer Fire Department. He served as a Deacon of the First Baptist Church in Garden City, Texas and he spent many hours volunteering and helping others when he could. He was a wonderful husband, father, and grandfather. He loved God and taught all of his family well the merits of strong morals, hard work, and love of family, community, and country. Viewing for Mr. Pendley will be from 5pm - 8pm Friday, September 7th at Integrity Funeral Service. The family requests memorials be made to the Hanna Cemetery Association c/o Trina Martin, P.O. Box 124, Hanna, Oklahoma 74845. Funeral Services are scheduled for 10:00 a.m., Saturday, September 8, 2018 at Integrity Chapel with Rev. Jack Vance officiating. Interment will follow in Hanna Cemetery under direction of Integrity Funeral Service.